You know how there are some people who manage to do so much in a day that just talking to them makes you feel like you need an electrolyte drink and a nap? My sister, Jamie, is one of those people. She’s employed full-time as a nanny, she volunteers, she works out more in a day than I have in the past year (sadly, I am not kidding) AND she’s getting her master’s degree. So when Big Lots offered to help me set her up for back-to-school, I jumped at the chance to create a relaxing bedroom oasis that she might, unfortunately, use more for studying than sleeping. We ended up going with a timeless black and white bedspread, which came with sheets, shams and a throw pillow. Seriously. I just kept pulling things out of the bag–there was so many pieces to the set! 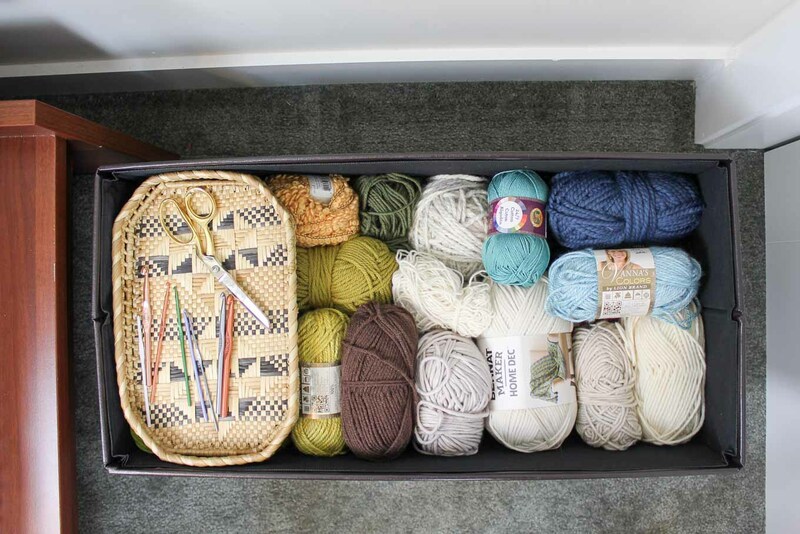 A storage ottoman made the perfect night stand that also serves a far more important purpose: craft storage. We also picked up a portable speaker, some throw pillows and THE softest blanket anyone in our family has ever touched. 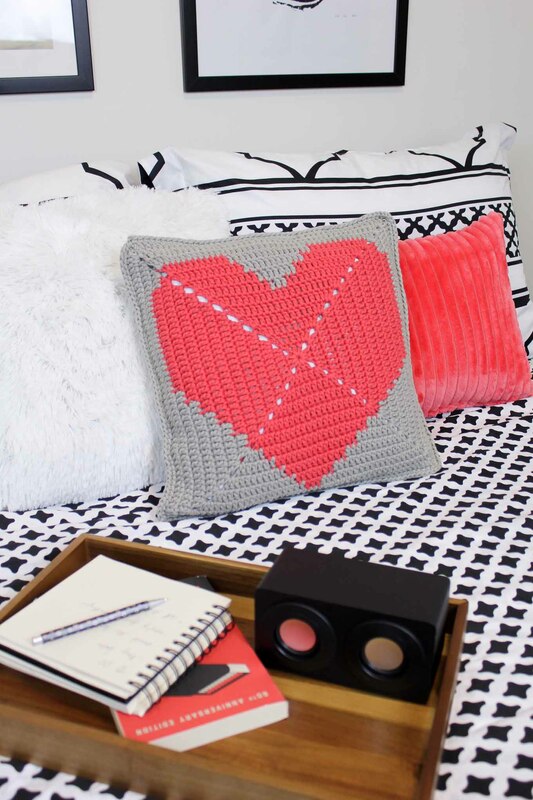 Of course, no room is complete without some handmade touches, so I decided to make Jamie a modern crochet heart cushion to coordinate with her new room. 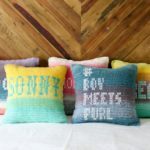 I think this crochet throw pillow pattern is the perfect way to give a college-bound friend or family member a tangible, huggable reminder of how much you love them. 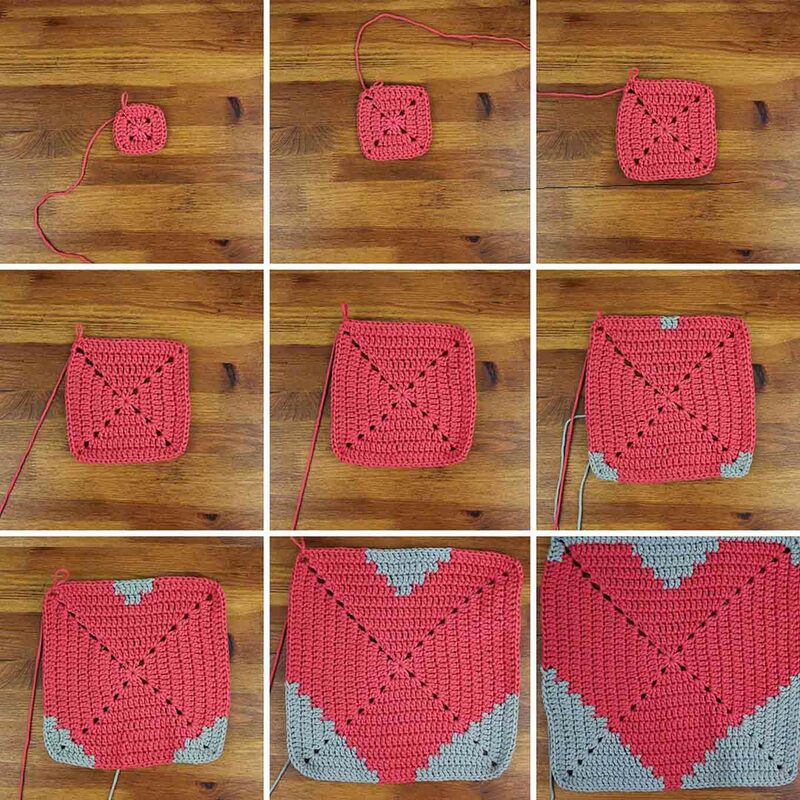 If you follow me on Instagram, you might know that I recently asked how people best like to follow crochet patterns: with videos, with charts or with written patterns. I was amazed to see that there was an almost mix of all three learning styles. So for the first time ever, I’ve created a chart for this pattern. I think it should help a lot in working the heart section of the pillow. 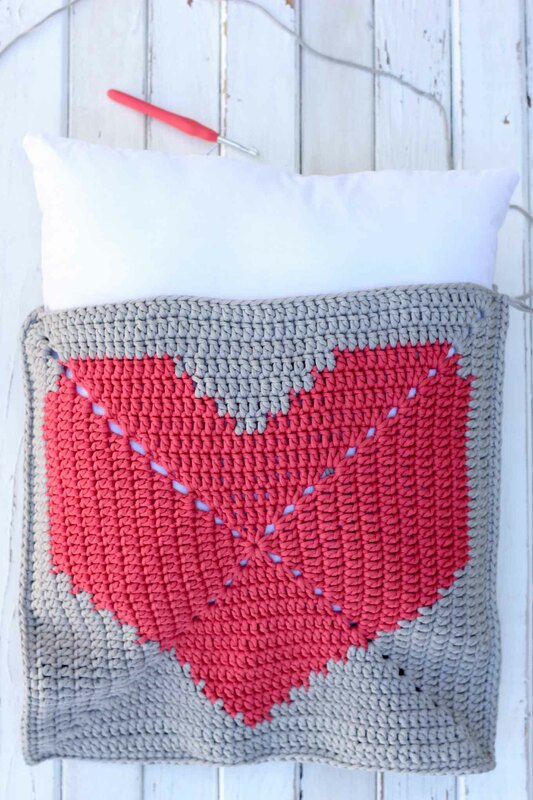 Simply subscribe in the box at the bottom of this post and you’ll gain instant access to my library of free patterns and templates including this heart pillow chart! I sincerely appreciate it when you share and pin my free patterns. 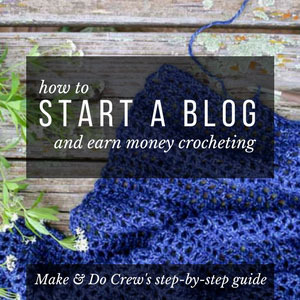 When people visit the blog, it helps support my ability to create free patterns. As always, thanks so much for being awesome. • This pattern is worked in the round, so the right side should always be facing you. • I used up just about every bit of my clay colored yarn to make this cushion. 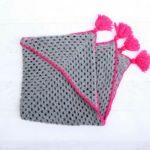 If you don’t want to risk needing to buy an extra skein, plan to crochet the two sides together with the pink yarn instead of grey or leave off the last round of both the front and the back of the pillow. It should still fit a 16” form. • I didn’t trim my strands as I switched between colors. I left them connected and made sure to allow for enough yarn in between each section that it wouldn’t pull too tight if the pillowcase was stretched a bit. See my note in the “finishing” section if you’re strands are showing through the spaces in the square. Side 4 (top): work [2 dc, ch 2, 2 dc] all in the next sp, 1 dc in each next 10 dc, 1 dc in each next 3 dc, 1 dc in each next 10 dc, 1 dc in same space as ch 5, join with a sl st to 3rd of 5 ch at the beginning of round. Side 4: work [2 dc, ch 2, 2 dc] all in the next sp, 1 dc in each next 10 dc, 1 dc in each next 7 dc, 1 dc in each next 10 dc, 1 dc in same space as ch 5, join with a sl st to 3rd of 5 ch at the beginning of round. Side 4: work [2 dc, ch 2, 2 dc] all in the next sp, 1 dc in each next 10 dc, 1 dc in each next 11 dc, 1 dc in each next 10 dc, 1 dc in same space as ch 5, join with a sl st to 3rd of 5 ch at the beginning of round. Side 4: work [2 dc, ch 2, 2 dc] all in the next sp, 1 dc in each dc till end of round, 1 dc in same space as ch 5, join with a sl st to 3rd of 5 ch at the beginning of round. For second side: repeat same pattern using only Clay colored yarn. Leave yarn attached. If you are seeing a lot of your “cobwebs” showing through in the background of your design, you can use regular sewing thread to lightly attach any unruly strands to a place where they won’t show through to the front. I didn’t actually find that my strands were very visible once the form was inserted. Place both squares together, right sides facing out. Line the stitches on each square side together. 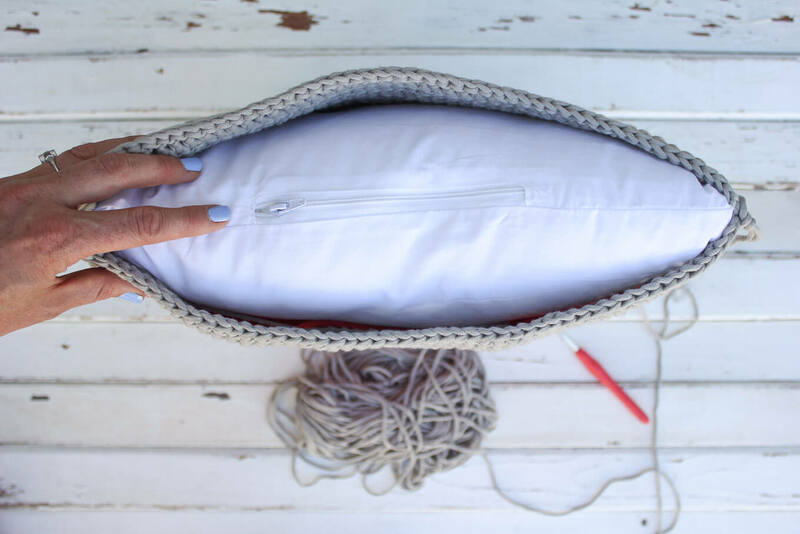 Insert hook through one stitch on one side of the pillow and all the way through to the corresponding stitch on the other side of the pillow and complete a sc. Repeat around three sides, working 3 sc in each corner space. Insert pillow form and work last side the same way. Fasten off and weave in ends. 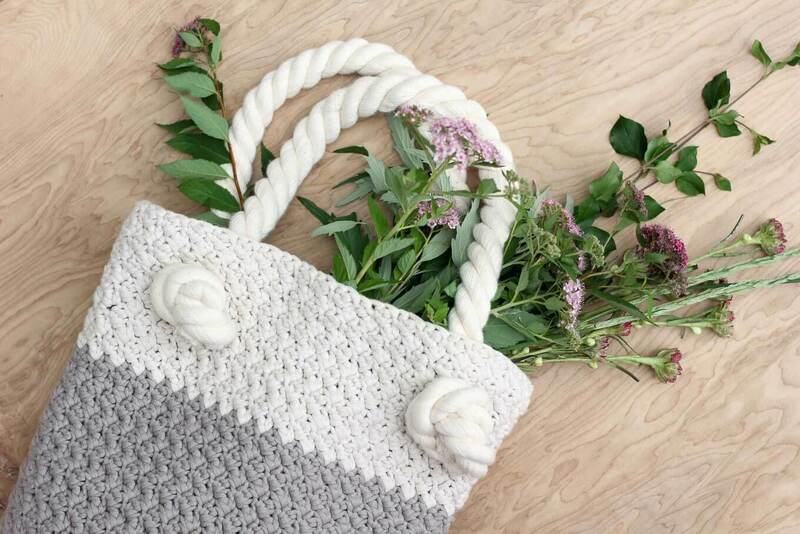 If you loved working with this Bernat Maker Home Dec yarn as much as I did, you might like my free, beginner-friendly Suzette tote bag pattern using the same yarn! 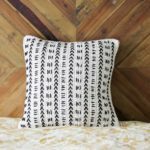 DOWNLOAD THE FREE PRINTABLE CHART FOR THIS PILLOW! 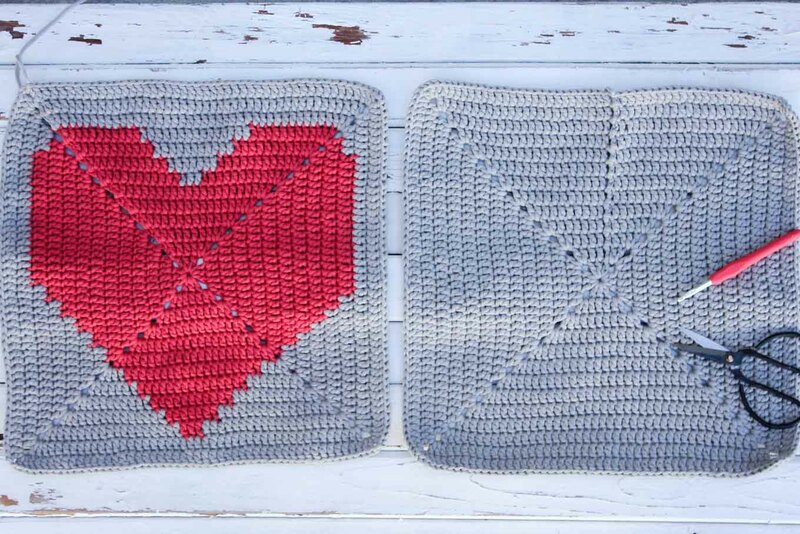 Gain instant access to the heart chart and all my other exclusive patterns and templates! Love the pillow. Want to make for my granddaughter.. Cute heart pillow. This will make many people happy. Those giving this gift of love, and those receiving their pillow. Thanks so much, Mary! I really hope it does. I had so much fun making it. Thanks Jess. I would really love to print the cushion pattern out, but I keep getting 18 pages and it’s also has parts insured by advertising and logs etc. Do you have just the pattern itself I could print out? I totally understand wanting to print the pattern. The way I earn money to cover the cost of this site is by running ads on it and people visiting the actual website. I’m in the process of creating very inexpensive PDF downloads so that people who want to print the patterns can do so. I’m sorry I haven’t gotten to this one yet. I hope to add a printable version very soon! I love your patterns, and have made the slippers with flip flops twice. However, I am not a fan of having to download a pdf converter to get this pattern. I have a granddaughter going off to college next month, this is a great pattern for her, but making me down load something I don’t need and possibly has issues, is a disappointment. You shouldn’t have to download a pdf converter to get the pattern. It’s listed within the post. Perhaps you clicked on an ad that asked you to download something? The only thing you’d have to download for this pattern, if you wanted to, is the chart part of the pattern, which is available in the subscriber Vault. I agree that downloading a pdf convertor is no good! Please know in the future that if you see that, it’s an ad and not actually part of my pattern. Making these for my daughter’s college bound friends & for her when she graduates next year! Hank you for the free pattern? I love this pattern! I’d like to adapt it and make a granny shrug instead of a pillow. Do you have any advice on making the heart bigger? What a cool idea, Karen! 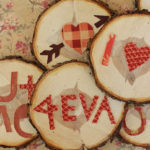 Let’s see, I think you could make the heart bigger if you used my pattern to create your own chart (simply on graph paper or on a site like Stitch Fiddle. 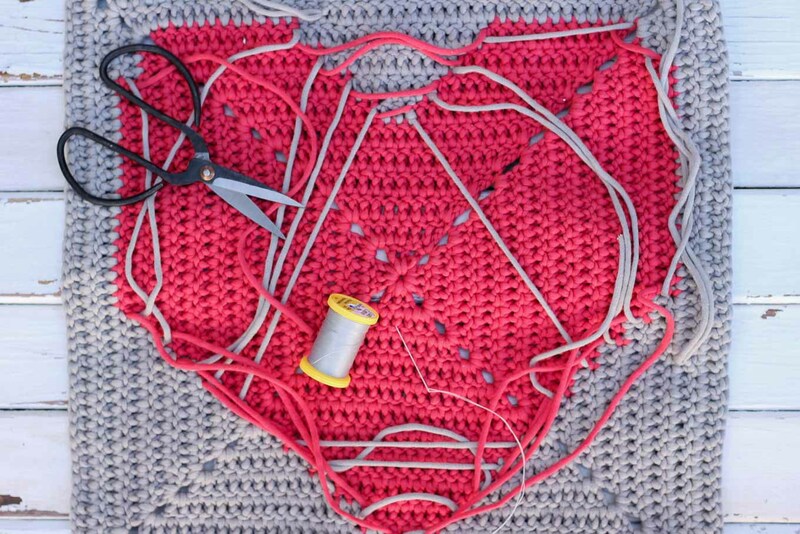 If you notice on my heart, as you progress toward the outer edge of the heart, each consequtive row is 2 double crochets shorter than the last on each edge. So if you just started with a much bigger center square, you could possibly just figure out the following rows with the same geometry logic. Does that make any sense at all? I’d love to see a pic of how it turns out. Sounds so cool! I am making this pillow for a Christmas present (never to early to start on those, right?) And the square will not lay flat and it is all wavy. Am I doing something wrong? Do you know how to make it flat? I really like (LOVE) this pattern. Thanks! NEVER too early to start Christmas presents, Alex! Hmm…I think I might know what you mean about the wavy-ness because mine was slightly wavy too. It might be the case that you are able to block most of it out or resolve it by simply stuffing the pillow inside. If not though, I would guess that it might have to do with how tightly or loosely you’re crocheting. If you’re willing to start over, you might consider using a slightly smaller hook to see if that makes it lie flatter and be less “ruffly.” Does that make sense? Hi,thank you VERY much for sharing your talents with me. You have inspired me SO much and helped me through a deep valley,with the way you teach. You really are a gifted Teacher who blessed more people than you will ever be able to count!! God bless you! Oh Sonia, it brings me so much joy to hear that. Making things with my hands has helped me through some tough times too. I like to work on my projects and think about how many people all over the world are creating something they care about at the same time. Now I can think of you in South Africa! 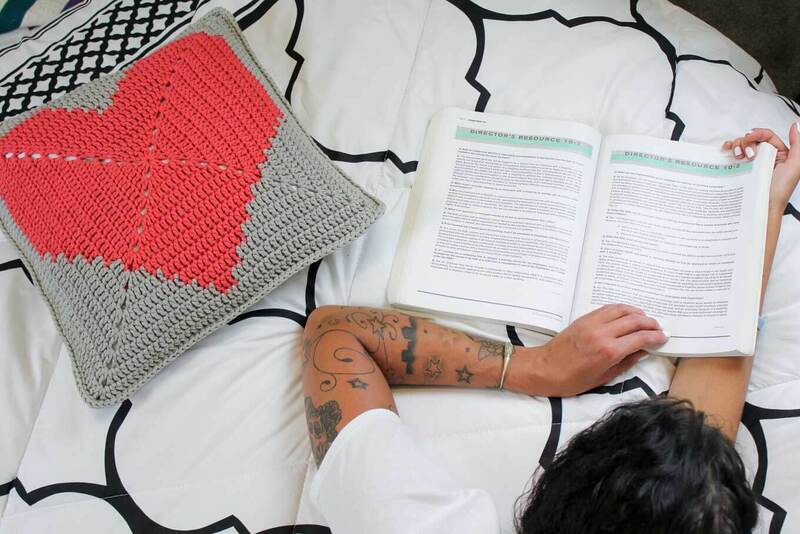 I’m having trouble finding the crocheted heart pillow chart. Help!! Did you already subscribe in the box above or on the sidebar? Once you do that, you should immediatly receive an email from me that explains how to access the Vault. 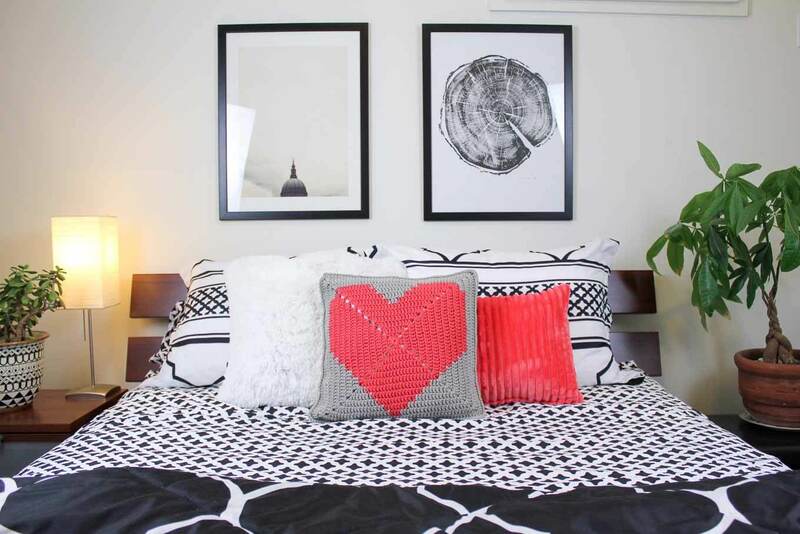 The chart is linked right below the photo of the heart pillow. Let me know if you still need help finding it! Sad that video is unavailable.